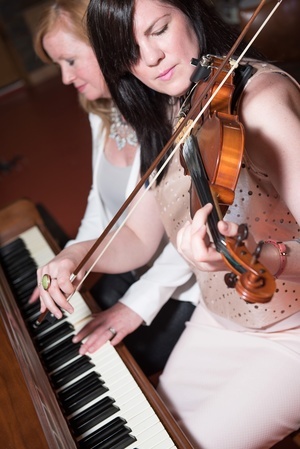 Building on their Ottawa Valley, Ontario roots, sisters Erin and Colleen Searson have developed their own original style of music, seamlessly blending high energy fiddling, passionate vocals and step dancing. Giving a more modern treatment to the traditional music of their upbringing, the sisters perform on a variety of instruments throughout their live show, which includes Colleen on fiddle, vocals and Ottawa Valley Step Dancing; Erin on piano, vocals, step dancing and tenor guitar; Dave MacDougall on drums and percussion, and Fraser Gauthier on bass/guitar. Searson recently released their 9th studio album, “Homegrown,” a tribute to the Canadian artists, songwriters and instrumentalists who have influenced the band. They are currently wading through two nights’ worth of concert footage to be used for their 10th CD and a Live DVD.